Buy 3 units of this product and save. By buying 3 units you will be purchasing at wholesale prices and can keep them for yourself or give them away as Christmas or birthday presents. In addition delivery is free (in Australia and New Zealand). The price per unit for this product is $17.50. Additional special discounts do not apply to this product. 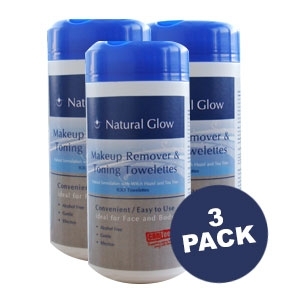 Natural Glow Makeup Remover and Toning Towelettes are a natural, gentle way to cleanse the skin of make up, perspiration, excessive oils and tans while toning the skin at the same time. It can be used on sensitive skin as this gentle formulation contains aloe vera, which soothes the skin, witch hazel for toning and firming the skin and tea tree for its cleansing and antibacterial properties to protect the skin. Use the Towelettes daily for the removal of makeup and to clean and tone the skin when needed. It is great to remove the Natural Glow More Cover Bronzer Mineral Makeup and also removes foundations, eye makeup including mascara gently and effectively. It is also great to remove any excess tan from the skin. The large pack and towelette format makes it an economical choice and easy and simple to use without the need for additional cotton swabs or towels. When used on the face or body there is no need to wash it off as it dries instantly, and the nourishing and toning ingredients remain active on the skin.